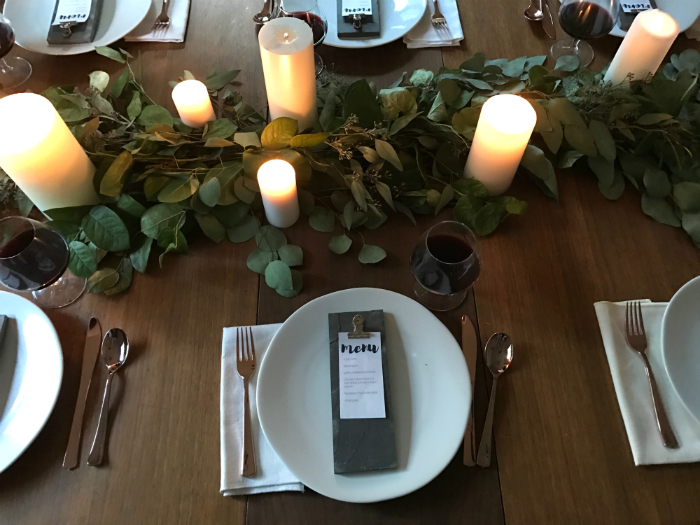 Early autumn is my favorite time to throw a dinner party: schedules aren’t so crazy and the weather begs to gather around some candles over some good comfort food. It’s still summer enough to be casual, but the anticipation of cooler weather and a change in season sets the mood for added effort. It’s a time for vacation recaps and the new beginnings that tend to come in with the fall. 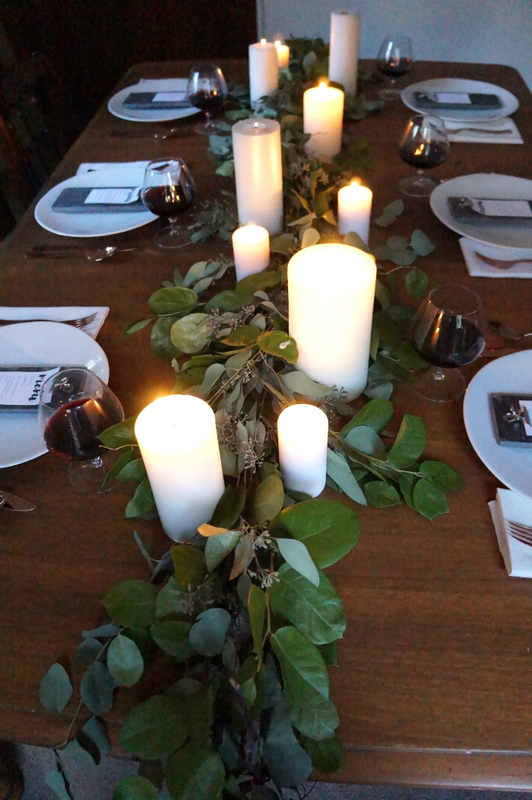 Grab some red wine, set the mood with as many candles as you can get your hands on, throw on some Ray LaMontagne, and invite a few friends over to catch up on the busy-ness of life. Head to your local florist (rochester-ites: Sargents has the best prices/selection) and ask to buy greenery by the bunch. I used silver dollar eucalyptus, seeded eucalyptus, and salal (lemon leaf). These greens last and look great for up to three weeks and smell amazing. Other great greenery options are: variegated pit, boxwood, bay leaf, or olive branch. 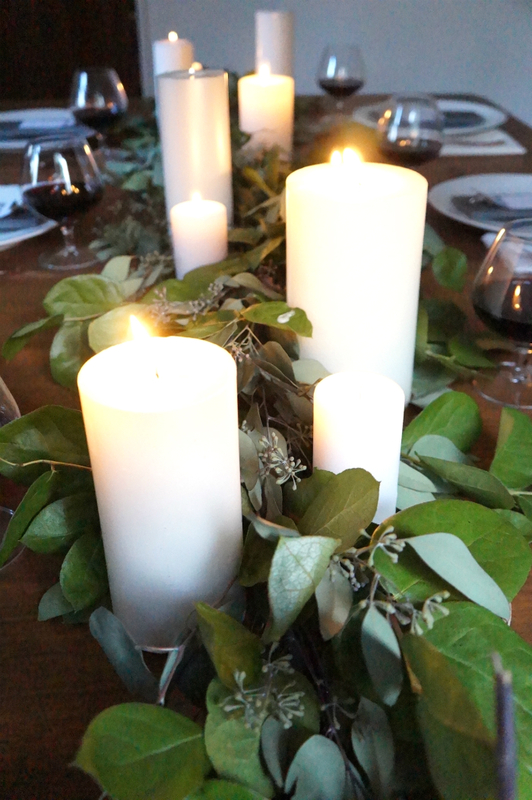 For every foot of garland, expect to use 1.5-2 bunches of greenery, or more depending on how thick you want your garland. Search the clearance aisles, thrift stores, and dollar stores for as many pillar candles as you can get. Tapers work great too! 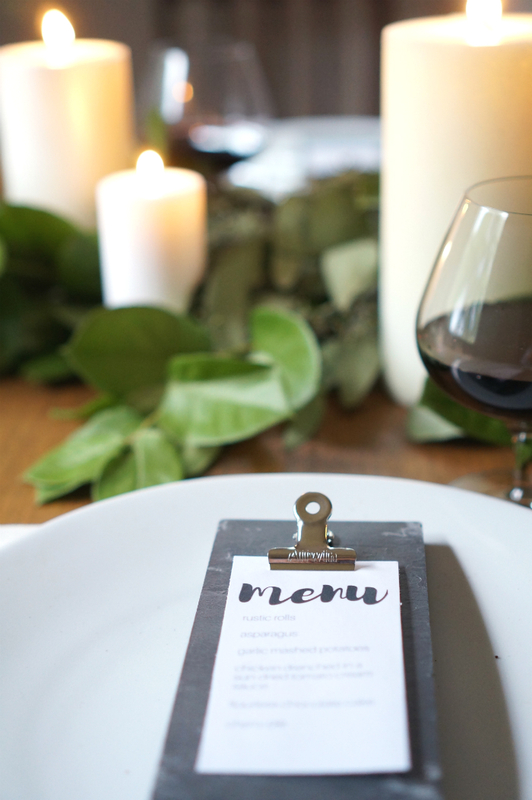 Red wine – grab some with coordinating labels and keep them on the table for additional, easy decor + super accessible for guests to poor their own. I love the look of name cards, but that automatically makes in an affair. Assigning seats isn’t for this type of get together. Instead, print out the menu. 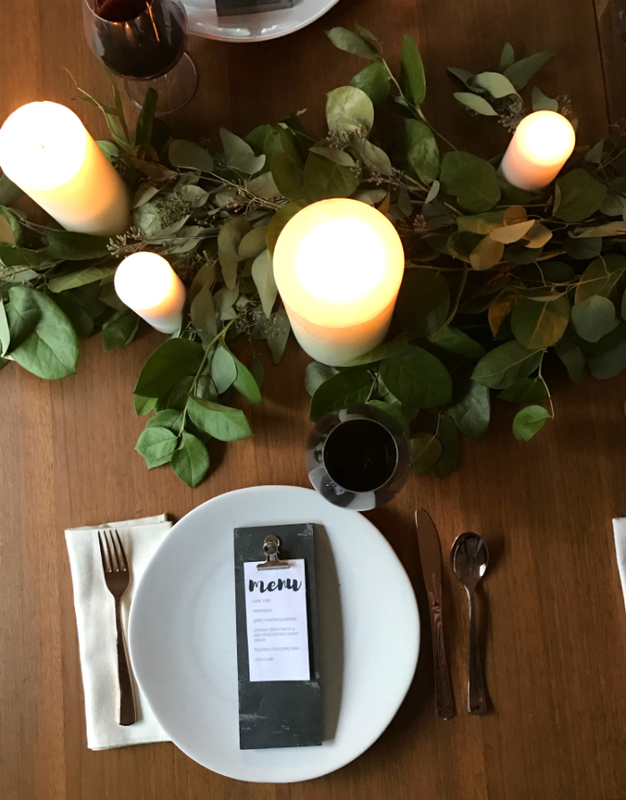 It takes less time because it’s not personalized and it keeps it more casual, but you still get that table set look of perfection. I printed these out on my home printer, clipped a bulldog clip on them, and placed in on a 2 x 5″ piece of slate tile you can pick up at your local home improvement store for about $0.53/tile. 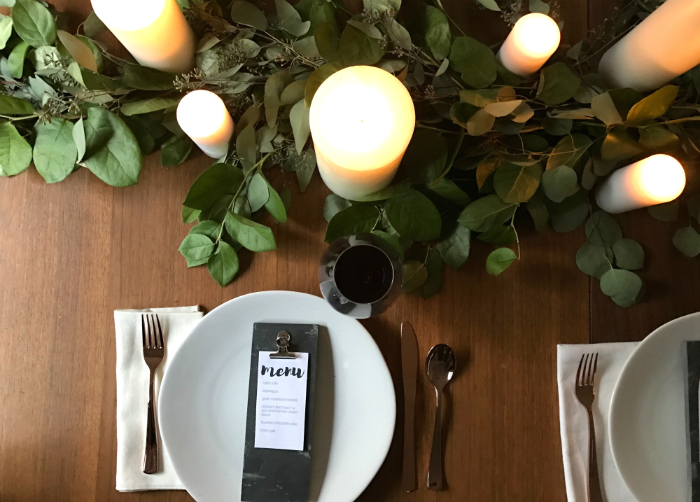 As far as the actual menu, keep it simple and hearty: a stew and fresh bread or crock pot sun dried tomato chicken and garlic mashed potatoes, a small salad or roasted veggies, and a flourless chocolate cake for dessert. Don’t feel you need to serve wine in wine glasses. If a different type of glassware fits your decor better, use it. These are some type of whiskey glasses (? maybe, i think), but looked better than my wine glasses. Also, to cut down on dishes, that silverware? Yeah, plastic. I found it on sale at the party store a month or two ago and have been saving it for a fall dinner party. I intended to throw it away, but it’s such good quality, I ended up washing it to reuse later. Plus, I loved the copper color. 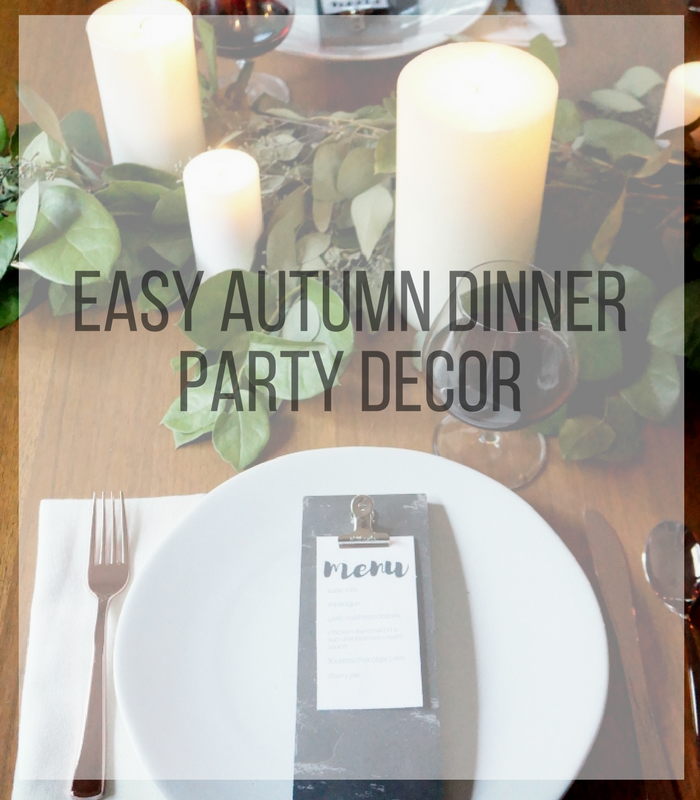 So there you have it: autumn dinner party decor that takes about an hour to throw together and costs less than $50. Even if you serve grilled cheese and canned tomato soup, it will feel like an intimate, refreshing catch up dinner with your closest friends and family.